Chief Justice Bart Katureebe launching the five-year strategy at the High Court in Kampala yesterday. Photo by Badru Afunadula. KAMPALA–The judiciary has received Shs6 billion for its ICT strategy which will, among other things, ensure that litigants who cannot appear in court physically due to various reasons like infancy, old age,distance and costs can give their testimony via audio-visual link. While officially launching the five-year strategy at the High Court in Kampala yesterday, Chief Justice Bart Katureebe revealed that government has so far provided Shs6 billion for the implementation of the strategy that will cost Shs36 billion in total. “In a meeting with the President two years ago, we presented a budget of over Shs36 billion and he directed the Ministry of Finance to handle the issue. This is part of the President’s pledge,” the Chief Justice said. Katureebe also tasked the Permanent Secretary, Kagole Kivumbi, to ensure that the funds received for the ICT strategy are fully utilized. “Every cent will have to go towards what it is supposed to do. You may wonder why we are here under the sun instead of being in a posh hotel. We want to account to the people who have given us this money,” Katureebe said. Explaining the importance of the ICT Strategy launch, Justice Geoffrey Kiryabwire, who chairs the Judiciary’s Technology Committee, said court users would follow their court cases on smartphones, a scenario he said would reduce human-to-human contact and help curb corruption. On the Small Claims Procedure (SCP) Performance and Activity Report for the years 2015/16, Kiryabwire, who also chairs the SCP Implementation Committee, said the posted financial recoveries by court litigants is significant and translates into a huge number of court users who have benefited from the innovation launched in 2012. SCP was established by the Judiciary to adjudicate over claims whose subject matter does not exceed Shs10 million and a lawyer is not involved. Such matters usually arise from supply of goods, debts or rent arrears, among other commercial disputes. Chief Magistrates’ Court at Mengo registered 500 cases and disposed off 437 of them in the last financial year, followed by Makindye court that registered 359 cases and disposed off 338 of them. 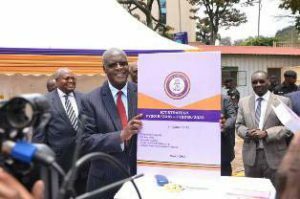 Justice David Wangutusi, who heads the High Court Commercial Division, said he is also a beneficiary of the Small Claims Procedure. He explained that after chasing after his tenant for long without paying rent, he opted to Small Claims and that his stubborn tenant cleared him the following day.